For the past couple of months, I have had the opportunity to introduce a couple of films at the Miami Beach Cinematheque. The October schedule will be reflecting a bit more of my input. Dana Keith, the cinematheque director, invited me to help in schedule the "Giallo and Beyond: Italian Horror Masters" that will comprise most of the films presented in October. Three films by Dario Argento - Suspiria, Deep Red and Tenebre will be shown because Argento is the best known of the giallo filmmakers, and the one most likely to attract the largest audience. 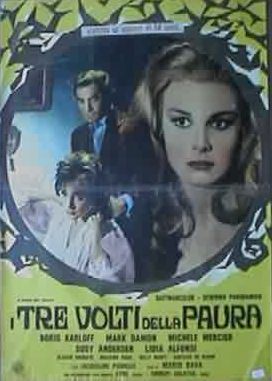 Mario Bava will be represented by Black Sabbath, to be shown with Fellini's episode "Toby Dammit" from the anthology Spirits of the Dead. Fellini has acknowledged that his use of a little girl as the devil was inspired by Bava's Kill, Baby, Kill. Lucio Fulci will be represented by one of his more artful films, Lizard in a Woman's Skin. There will also be three films from NoShame. In addition to the Miami Beach premiere of Mariano Baino's Dark Waters on Holloween, I will be introducing Emilio Miraglia'sThe Red Queen Kills Seven Times and Sergio Martino's Your Vice is a Locked Room and Only I Have The Key. Inside the cinematheque will be the exhibition A Suspirian World, a softsculpture installation with performace by Rachael Hoffman and Kelly Boehmer. The cinematheque will feature Monserrattz and DJ Maximus with their Trilogy Of Terror music video release on Halloween Night. I will mostly be writing about horror films in October as I did last year, with detours to cover the Italian Film Festival and other noteworthy films.